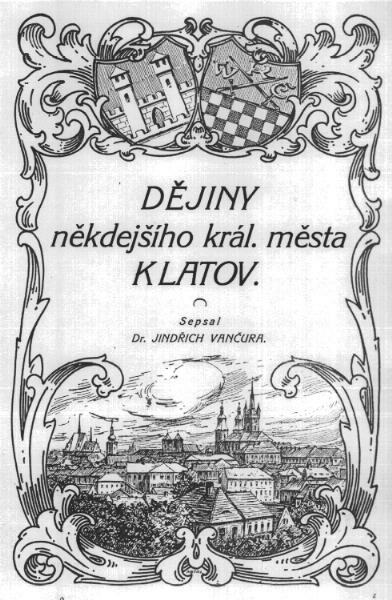 Below is text from the monograph: Dr.J.Vancura: History of the former royal town of Klatovy (2693 pp. in 5 volumes, issued 1927-1936 by O.Cermak's printing house at Klatovy) that tells of a Vaclav Vyborny and Jiri Vyborny who lived in the town of Klatovy in southern Bohemia, relatively distant from Kutna Hora and N.Brod. Since Vaclav was buying property as a tailor’s guildmaster it is likely that he was born before 1575. Their relationship to any other Vybornys is unknown. Their use of the Vyborny surname precedes Frydrich Vyborny which could raise doubts about the Vyborny/Cernik legend. 1. 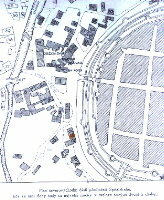 They were members of a separate Vyborny family (families) who did not leave any descendents or his descendents are unknown to this site. 2. 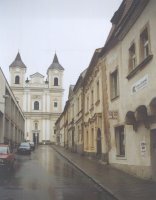 They were members of the same Vyborny family (families) that current Vybornys are descended from but for some reason moved to the town of Klatovy. 3. The Vyborny family may have originated in Klatovy, Southern Bohemia. Vaclav’s and/or Jiri's descendants or relatives may have moved eastward into central and eastern Bohemia (Tabor, N.Brod, V.Podol, Caslav and Kutna Hora) from where most of the Vybornys are descended. Since Klatovy was forced to become catholic after the introduction of the Jesuits in 1636, it might have given the Vybornys reason to leave Klatovy. The recent discovery of the records of Berni rula archive (1654) could be supposed as some support of the migration hypothesis. The last hypothesis might explain the tendency of many of the early family members to have darker features than most Czechs ("The Vyborny Book" of MUDr. Josef *1864). The royal town of Klatovy was located on the merchant's road that connected the Bohemian kingdom to southern Europe. The people of Klatovy would have had more contact with people from southern Europe than most Czechs. 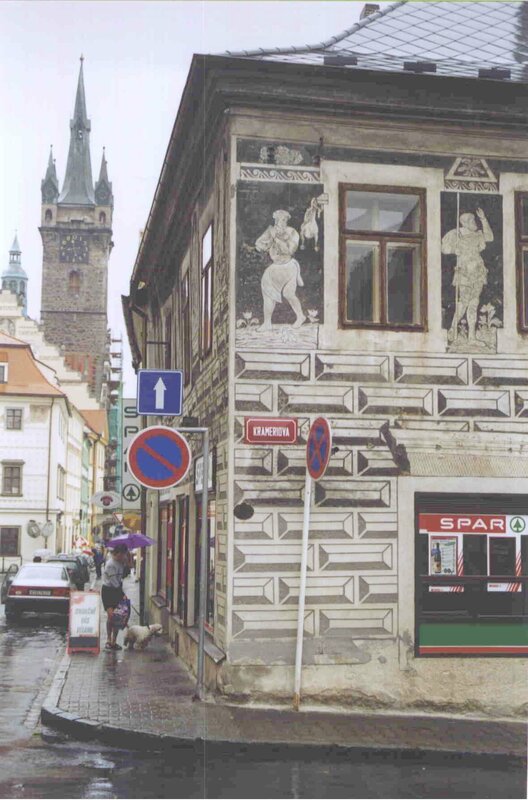 It is possible that some people from southern Europe settled in Klatovy and intermingled with the Czech people there. This material was originally obtained by Dr. Gene Wyborney from a source which has been unknown to the site. It was provided to the site by Leigh Wyborny. Karel Kysilka a Czech genealogist and historian succeeded to indentify this book recently.
" Next to the previous house[No136]there was the house No137. The previous owners are unknown. In 1585 "little Honz" or "Jan Honz the tailor" owned this house. The citizen Vaclav Vyborny bought the house from him [Jan Honz] for 100 kops [kopa = 60 pcs - of some coins - "of Meissen's"] in 1597. 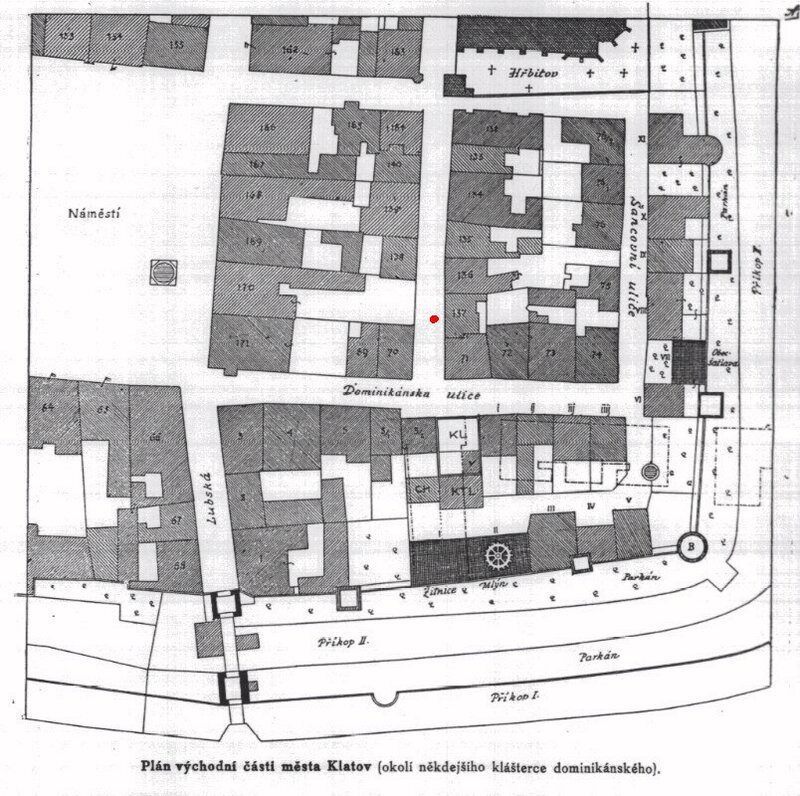 The latter still owned this house even in 1619, when a tax of 46 kops and 30 gr [gr = "gros", a smaller coin] for the benefit of the high-born Divis Koc of Dobrs and of Bystrice and of Obytce was charged against this house..."
A note regarding Jirik Vyborny who bought the house #63 at Loubsky suburb (southern from the city of Klatovy) in 1600.
left - Former map of the Spitalsky & Loubsky suburb of Klatovy (according to Dr.Vancura's map). 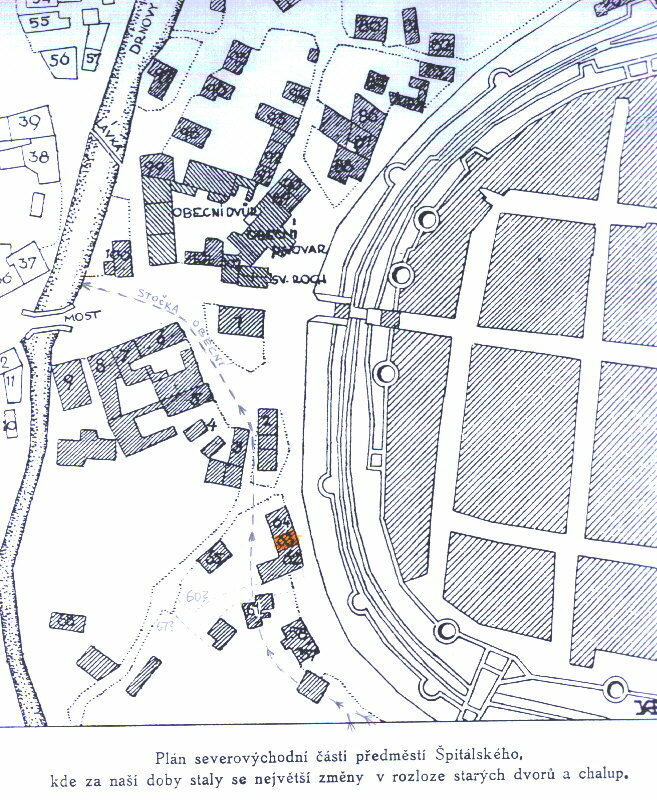 The house denoted by orange color. The picture can be enlarged by clicking on, even greater format 221 kB here. 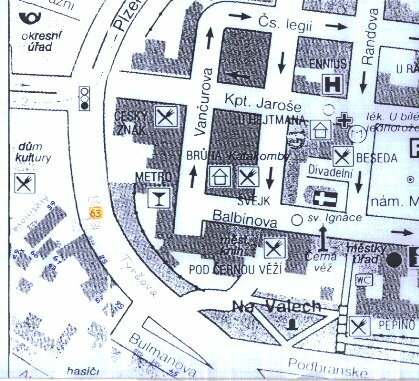 right - The former house #63 as indicated in the present Klatovy map. The picture can be enlarged by clicking on, a greater format 253 kB here. Photographs of the former house #63 locality here. Jirik Vyborny was murdered in a street conflict in 1613. He left his widow Zuzana [Susan] and little children Jan, Anna and Katerina. The conflict and the subsequent trial briefly described. Mr. Stangar's neighbor was also a tailor, little Hons of German heritage. In 1577 he [Jan Honz], Mr. Jan Spulsky, and Tomas Svoboda, were witnesses to the marriage of Havel Cervenka of Susice and Anna the daughter of Tomas Kveton of Susice. Due to incompleteness of the sales record, we do not know from whom and when Jan Honz the tailor alias little Honz bought house #137 on Krameriova Street. In 1597 Vaclav Vyborny bought this house from him [Jan Honz] for 103 kops. The sale was witnessed by Jan Kavin and Jirik Vrba in the hospital where Mr. Jan Honz lay. 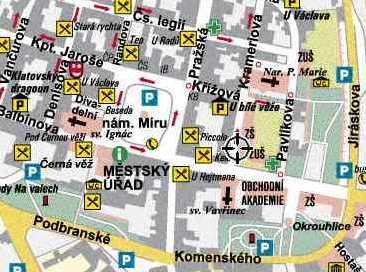 left - the black circle sign in the map denotes position of the former house No.137 Krameriova street, Klatovy ( click on to enlarge the map). 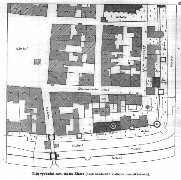 right - original localization of individual houses of Krameriova street (according to Dr.Vancura's map). The house #137 (of Vaclav Vyborny) denoted by the red spot. The picture can be enlarged by clicking on, even a greater format 300kB here. left - the corner house #70. The " Black Tower" on the background (the former Jesuit College of Klatovy was located near to it). The picture can be enlarged by clicking on, even greater format 206 kB here. 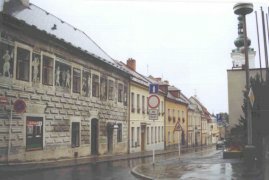 right - view along the Krameriova Street toward the " White Tower" (the bell-tower of the adjacent deans' church). The numbers of the houses on the left side (from the left):#70, #180, #138, #139, #140, #164. The house #137 (of Vacslav Vyborny) was located on the right side of the street. This side has been demolished in 1970's due to building of a new house so the #137 has been lost. 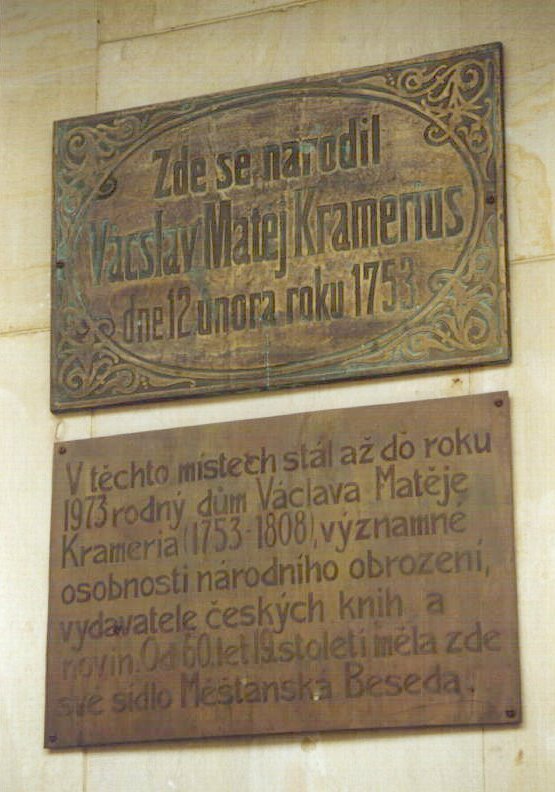 Even the birth house of the famous Czech Revivalist Vaclav Matej Kramerius (*1753, +1808) situated just by the White Tower has been removed (the street is named after him). The picture can be enlarged by clicking on, a greater format 280 kB here. ...which had been broken and repaired without an approval of the Emperor. Following this complaint on August 21, 1607 the Emperor ordered Vit Jedlicka to bring the seal of the union of Klatovy to the Emperor's Office. He [Vit Jedlicka] had to wait for the Emperor's decree. No information about this outcome was preserved. left - view to the southern end of the street. The church of St.Vavrinec [Lawrence] on the background. The picture can be enlarged by clicking on, a greater format 227 kB here. right - the memorial tablet on the new building denotes position of the former birth house of V.M.Kramerius. The picture can be enlarged by clicking on. 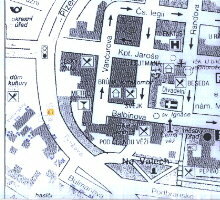 From the tailor's guildmasters this year, Vaclav Vyborny was owner of the house No.137 on Kramerius's street [translator's note: names of streets are those used after 1918] which he bought in 1597 for 100 kops from Jan Honz the tailor. His widow Katerina Vyborny owned the house util 1640. He [Vaclav Vyborny] also owned a little house [a cottage] on Chuchle [a locality which still exists in Klatovy town] which he bought from Vaclav Temle in 1615. Jakub Tichy also known as the tailor from Sobeslav town owned the hopgarten named "behind the latch" which he sold in 1611 for 88 kops. 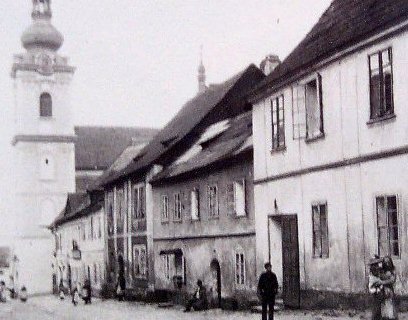 (of Mr.J.Jirik's collection of Klatovy historical pictures). The house #137 is the second one from the right. Click on to enlarge the picture. More about the house here. Contrary to all previous pages this one is of another style - it describes troubles of the citizens of Klatovy town caused by military troops occupying the town. There is an overview given on this page of rates and contributions which different towns and villages of this region was forced to pay to the occupying military forces. "...From Klatovy town there was sent there: 25v [old czech unit of volume] of beer, 200 gb [another unit] of rye, 6 gb of oat, 70 calves, 20 sheep, 60 hens 1). Beer was sent even from Bezdekov (60? ), from Janovice together with Vesely, Tesetice[?] and Klenovy (6), from Tejnec (4), from Folyne (8? ), from Chudenice[?] (8? ), from Desenice (12), from Besiny (12), from Obytce[?] (1? ), from Male Petrovice (6), from Velke Petrovice (8? ), from Nemcice (10), from Svihov together with Unovice (10) and from Porici (15). Most of the grain was sent by Porici (100 gb both of rye and of oats), by Svihov and Unovice (70 gb of rye and 36 gb of oats), by Desenice and Besiny (60 gb of both commodities), by Hostice[?] (60 gb of rye and 6 gb of oats), by Nemcice (40 gb of both), by Bezdekov, Janovice together with Vesely, Tesetice with Klenovy and by Folyne (40 gb of rye, 25 gb of oats), by Chudenice ( 20 gb of both), by Velke Petrovice (20 gb of rye, 20 gb of oats), by Tejnec and Lhota (a&135; 25 gb of both), by Male Petrovice (25 gb of rye, 20 gb of oats), by Obytce (20? gb of both), by Cihan[?] (22? gb of both), by Kydliny (10? gb of rye, 12 gb of oats), by Dolany[?] with Malkovy and by Vrhavec[?] (10? gb of both). Animals were sent from Poric (4 calves, 8 sheep), from Chodenice (4 sheep only), from Svihov with Unovice (calves 3, sheep 6), from Besiny and Dusenice (calves 3 and sheep 6), from Nemcice (calves 2, sheep 4), from Bezdekov, Janovice with Vesely, Tesetice with Klenovy (2 calves and sheep), from Male and Velke Petrovice ( calf 1 and sheep 3). A dozen hens were sent by Desenice, by Besiny, by Male Petrovice, by Cihan, by Nemcice, by Svihov with Unovice and by Porici. Ten hens were sent by Tynec, by Folyne, by Chudenice and by Lhotka. Six hens were sent by Bezdekov, by Janovice with Vesely, by Tesetice with Klenovy, by Vrhavec, by Kydliny and by Velke Petrovice; by 5 hens were sent by Dolany with Malkovy and by Mostice. Only Obytce did not send hens. (ibidem p.55). The citizens of Klatovy town complained once more of the great and unbearable troubles caused on their town by Lafuos's soldiers by sending a letter to the military representatives of the County at Plzen [Pilsen] town on May 14, 1633. After they [citizens of Klatovy] could not collect 1000 zl [zlaty (golden coins)] and 200 Imperial Tolars required by the captain, he [= the captain] had their councilors imprisoned. By Jun 6, 1633 they had collected only 154 Imperial Tolars. Jiri [George] of Kralevice and Jan Adam Roth were sent to the military representatives at Plzen to ask for relief.